Small distilleries are reaching the critical mass needed to shake the market—and now they hope to seize the moment. 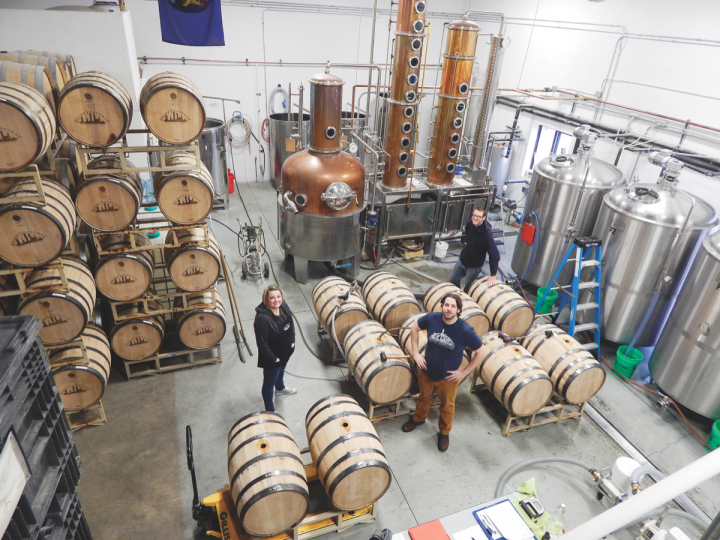 Northern Michigan’s Grand Traverse Distillery (staff pictured) sources nearly all its ingredients from local farms. In 2003, there were 60 craft distillers operating in the United States. Today, that total is 760, according to the American Distilling Institute (ADI), and a further 200 are under construction. The craft category, of course, remains very small. The Distilled Spirits Council of the United States (DISCUS) defines small distillers as those producing under 100,000 nine-liter cases a year, and more than 95 percent of today’s players make fewer than 50,000 cases annually, according to the ADI. Analysts at brokerage firm BNP Paribas estimate small distillers’ total spirits market share in the United States at 1.7 percent by volume and nearly 2 percent by value, with gross income nearing $450 million in 2014. As with craft beer, the craft spirits category is ascending swiftly. The ADI estimates current growth at around 30 percent. Its market share has doubled in the past two years, and analysts at the ADI believe that it could hit 8 percent by 2020, coming close to recent share levels achieved by craft beer. Much of the credit goes to whiskey, which represents 37 percent of all craft labels, followed by gin at 13 percent, vodka at 12 percent and rum at 10 percent, according to BNP Paribas. 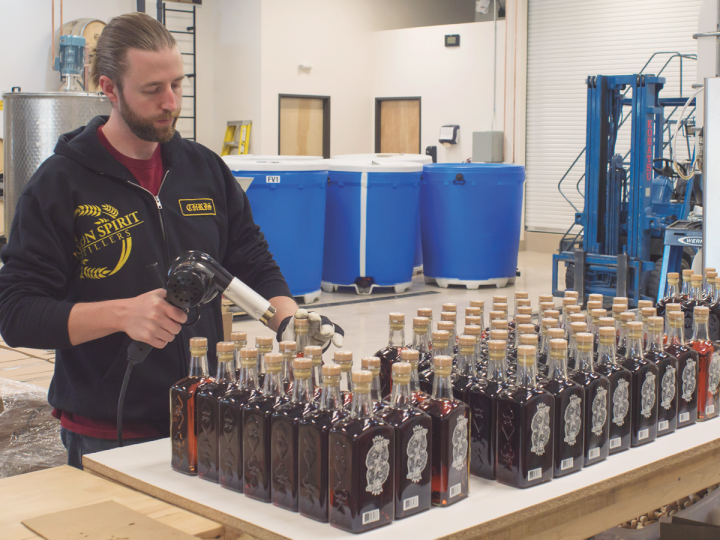 Newport, Oregon’s Rogue Spirits (cooper Nate Lindquist pictured) takes an innovative approach to both its products and its processes. The distillery has its own in-house cooperage. Industry deal-making shows that the big distillers are paying attention to the craft category. William Grant & Sons bought the Hudson whiskey line from Gardiner, New York’s Tuthilltown Spirits in 2010. Proximo Spirits purchased Hangar 1 vodka from Alameda, California’s St. George Spirits and also acquired Denver-based Stranahan’s Colorado whiskey that same year. Gruppo Campari bought Canadian craft whisky player Forty Creek Distillery in 2014, and Bacardi purchased Louisville, Kentucky–based Angel’s Envy Bourbon last year. “The bigger players are undoubtedly tracking the craft companies, and I predict they’ll be making more offers,” the ACSA’s Jenson says. 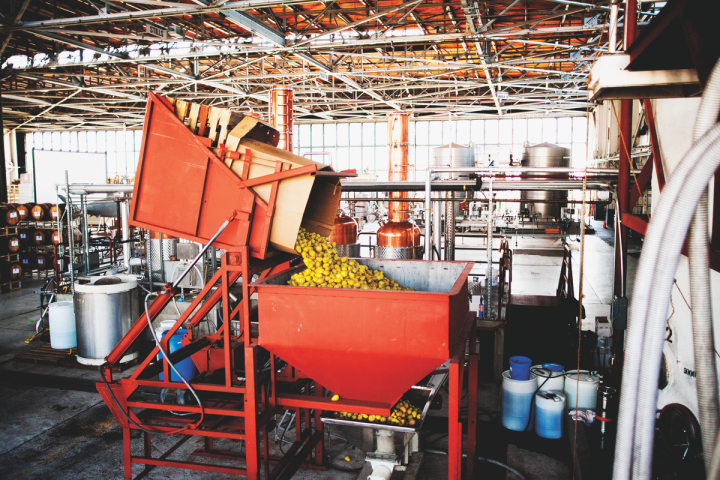 Many distilleries have launched expansion projects. 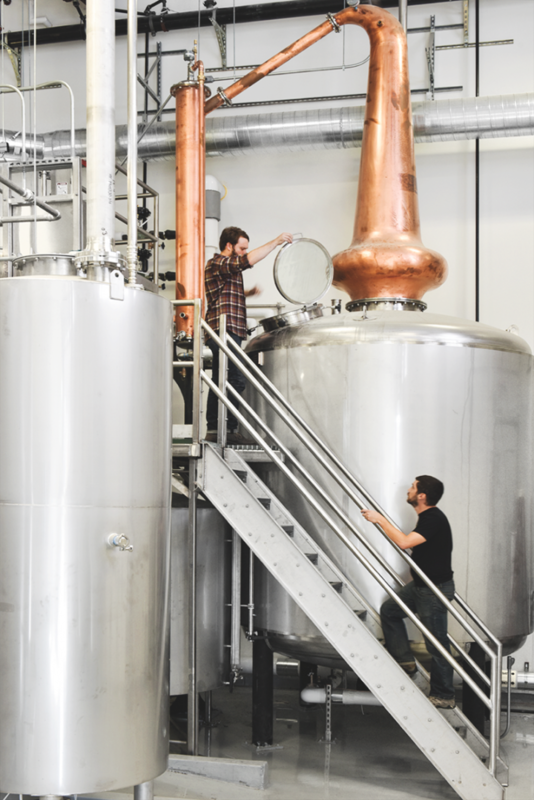 Tom Mooney, co-owner and CEO of House Spirits Distillery in Portland, Oregon, tripled the size of his production facility to 13,000 square feet and installed a new 3,000-gallon pot still last year. He raised capital from some high-profile partners, including retired professional football player Joe Montana, who’s been a co-owner since 2011. Mooney says the new facility will allow House Spirits to boost production of its flagship Aviation gin ($30 a 750-ml. bottle), which depleted 20,000 cases in 2015. The company is also ramping up production of its Westward Oregon Straight Malt whiskey ($50 a 375-ml. bottle). 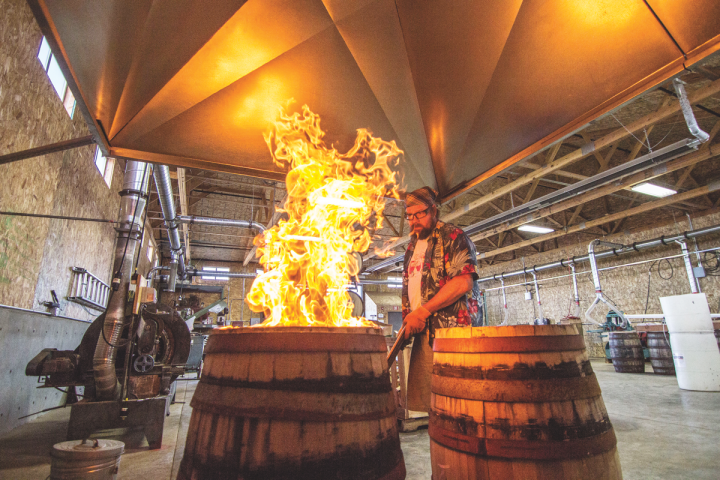 Rogue Ales and Spirits in Newport, Oregon, has made a name for itself by emphasizing innovation. “Our passion is creativity,” president Brett Joyce says. “We’re trying to do things nobody else does.” The company produces Oregon Single Malt vodka, a Chipotle whiskey that’s infused with locally grown alderwood-smoked jalapeños, a Spruce gin that’s made with the tips of spruce branches and a Pink Spruce gin that’s finished in Oregon Pinot Noir barrels for about six months (all $45 a 750-ml. bottle). But enlisting distributors is still a challenge for most craft players. Brad Irwin, owner of Oregon Spirit Distillers in Bend, Oregon, has been making his Wild Card absinthe ($50 a 750-ml. bottle) and One-Eyed Jon Spiced rum ($30) since 2012, but most of the company’s sales are limited to the Northwest. Earlier forays into California didn’t work out, though Oregon Spirits is lining up a new wholesaler for a fresh push in the Golden State later this year. “Some distributors will tell you that if you can’t give them 100,000 cases, then what’s the point?” Irwin says. Most craft distilleries serve a particular region. Oregon Spirit Distillers (production assistant Chris Deck pictured) primarily offers its absinthe- and rum-driven lineup in the Pacific Northwest. 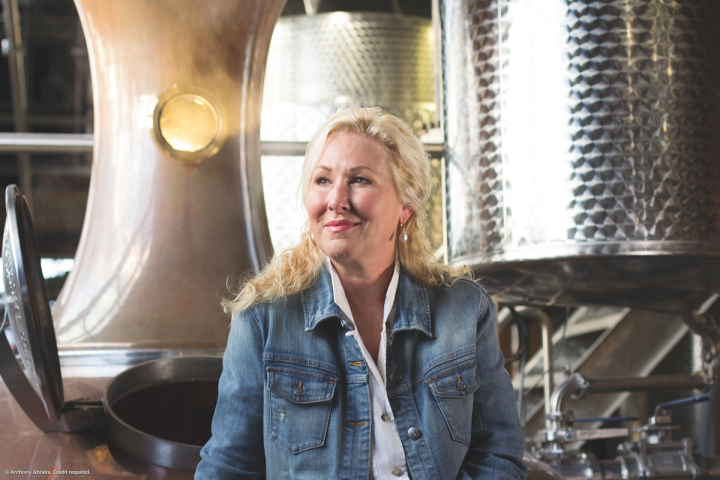 New distilleries are often being built on a larger scale to allow brands to break out early. In Minden, Nevada, entrepreneur Christopher Bently is spending millions to open Bently Heritage Estate Distillery in a historic flour-milling center. In the heart of Bourbon country, David Mandell has assembled an investor team to pour $25 million into the nascent Bardstown Bourbon Co., due to start production in late summer. Mandell’s operation will be so big that he expects to sell raw distillate to craft rivals. He also plans to build a hotel and restaurant on the 100-acre property and has hired former Maker’s Mark Bourbon distiller Steve Nally to make his product. 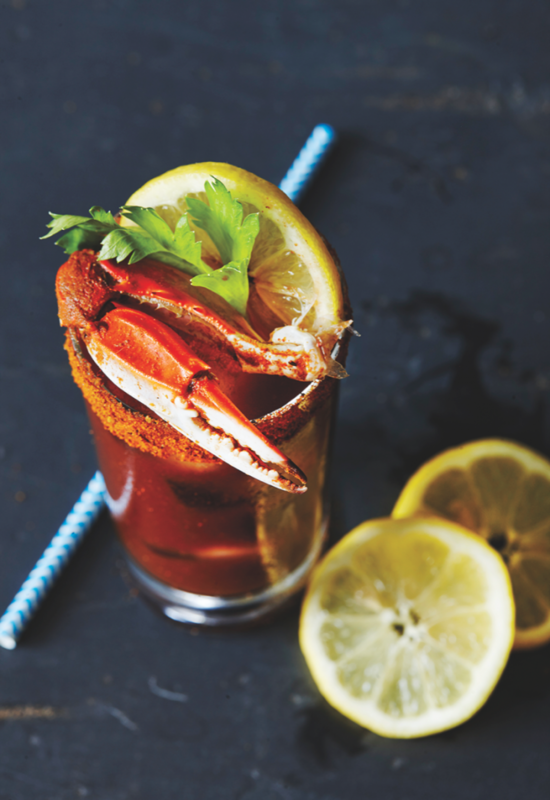 Bars and restaurants are eager to tout independently made spirits to locavore-minded customers. Local 360 restaurant in Seattle sources nearly all its products within 360 miles. The venue makes its Old Fashioned ($10) with John Jacob rye whiskey from nearby Fremont Mischief Distillery and its Quincely Jones cocktail ($10) with locally produced Tattoosh Single Malt whiskey. Local 360 has even begun aging some of its own Bourbon in-house with distillate acquired from 2Bar Spirits of Seattle. Premiumization Trend Drives Imported Wine’s Growth In The U.S.